bought a 2001 VTR last night.. serious buyers regret right now.. not sure what to do..
it has 74k KM. on it and the timing chain has jumped a tooth. typical JRA(just riding along) and it quit.. the chain tensioners are good.. I was surprised.. so why did it jump?? motor is not out yet just valve covers off. so I will see how bad it is when I drop the motor..
road rash.. it's been dropped. 10mph..so he says.. front fairing is cracked on the left.. rashed on the right.. rear fairing is rashed as well and tip of front fender. motor side cover was damaged and has been welded.. So why did I buy this hunk of junk.. two brothers exhaust. customer seat.. fender eliminator kit, rear tire hugger.. wheels and front end look good.. Fix it up or part it out? Last edited by Renderw; 08-10-2012 at 07:23 AM. Just check the valve clearances to see if it has bent a valve as Front CCT is prone to spring breaking - if bent valves replace, retime and bung in some manual Cam Chain Tensioners front & back - No need to drop engine though it'll be tight squeeze accessing the front cylinder - undo and move oil cooler. Recommend you restore to original - with manual CCTs and decent replacement R/R it'll be good for many more miles. Check the workshop section for more details on fixing things and common aliments. The ccts may not look damaged until you pull then apart. There is a C clip that holds it together, take that off and you can slide it open to inspect the spring inside. Broken spring = failed cct. CCT.. what is that? chain tentioner..
yep, CCT= cam chain tensioner. For $660 you can't really go wrong. Parting is a pain in the ***, but you can definitly get your money back if need be. the guy told me that it was NOT the CCT.. WRONG! it was! so what now is the question..
my thought is to roll the motor or over and see how close the timing marks are to where they are supposed to be..
Can I roll the motor over with no CCT installed? do I just tention with a piece of wood or somthing.. or is this a big risk? 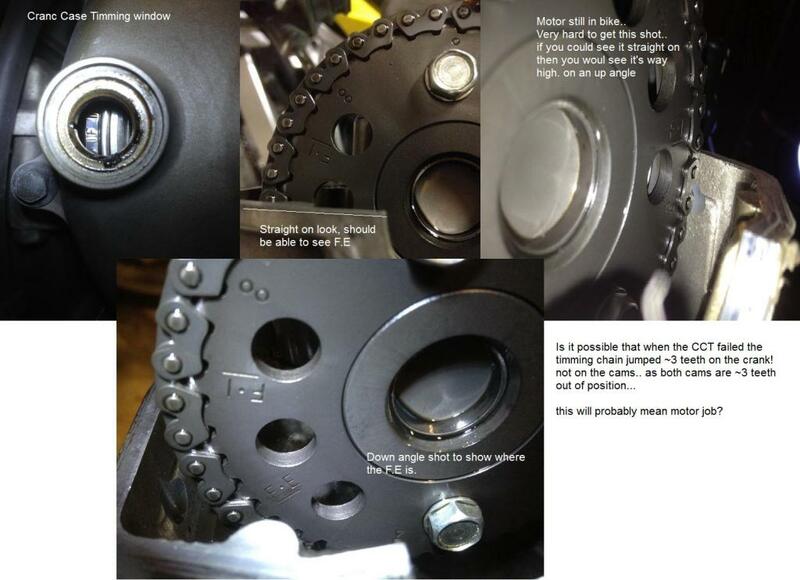 front cams appear to be 3 teeth out of sync with crank.. is this possible.. yes the CCT broke.. yes the bike died.. but both cams moved together 3 teeth out? Dude at the minimum you have bent valves and failed tensioners, but that's really the extent of the damage unless the guides got screwed. Order up some manual cam chain tensioners and get ready to pull the heads. Or if youyr in SoCal let me know and I'll take it off your hands for $760! Remove the heads and check the damage... if it's more then bent valves, a complete used head makes more sense the just valves. Repairing broken valve guides can be expensive and not well done unless you have a good shop. Good used head, seats cut, new valves, seals, locks installed.. And you can put a like new head on with confidence. Add some manual CCT's and your all set. Quick Reply: VTR newb. part or rebuild?